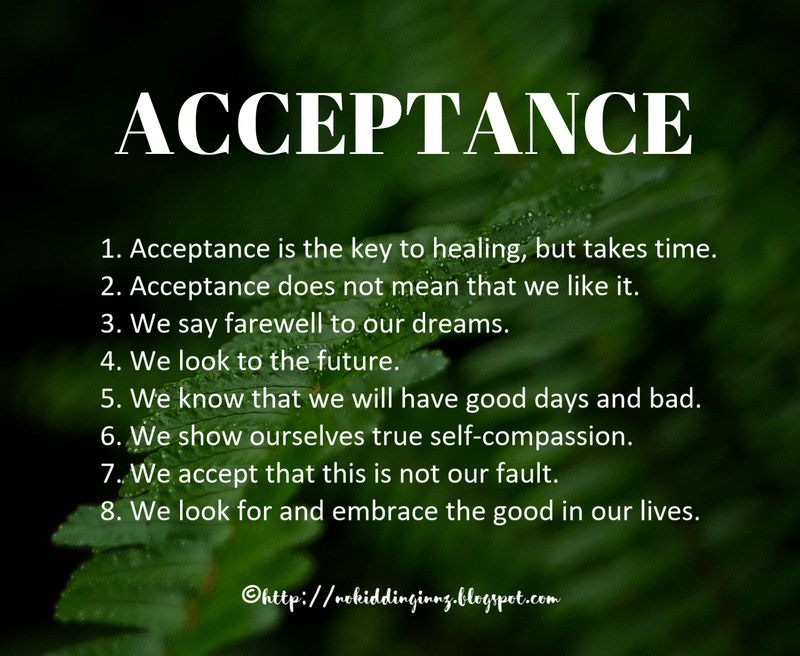 Acceptance is the key to healing after infertility, but it is not a simple process, taking time, and most importantly, an openness to the possibility of finding acceptance. Acceptance does not mean that we are saying “it’s okay that this happened to me,” or that we don’t really mind that we didn’t have children. Acceptance is simply an understanding that what we wanted isn’t going to happen, and a farewell to our dreams. We accept that our lives can and will still be good, productive, fulfilling, and we turn and look to the future. We accept that grief, anger, and other emotions will still come, but so too will joy, happiness, and gratitude, even if we haven’t quite grasped them yet. We accept that we are valuable individuals, just as worthy of love and deserving of a good life as anyone else, and show ourselves true self-compassion. We accept that this is not our fault, and we banish the guilt that “maybe we didn’t want it enough/try hard enough,” by banishing the negative thinking involved in infertility and childlessness. We start looking for the good in our lives, and we embrace it when we find it, feeling joy, happiness, and gratitude free of guilt, because there really is no other option. 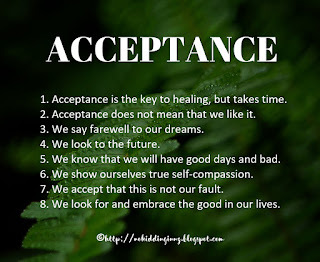 For more information: Click herefor a link to the 132 posts with the label “acceptance." Note: This post was prompted by some questions I received, and some posts on other blogs. Most people, when asked about what is important, will say, “family.” The ones who say that are usually the ones who have family, and if the question reminds them to hang on to their family members, and to tell them how important they are, then I guess that’s a good thing. But I actually think a lot of people give that response as an easy way out of what can be a difficult issue, and a way that doesn't require further thought. As we all have observed, a focus on family can be a selfish one – ignoring all others who might need or want or deserve your attention. And a focus on family is meaningless if you had family and lost it (physically, geographically, emotionally etc), or never had it in the first place. Ultimately, I think life is both broader and narrower than that. We are all individuals. We need to like ourselves, or change the things we don’t like, to be able to live within ourselves happily. We need to be aware – of ourselves and our actions, and of what is important to us. That way, we can begin to reach outside ourselves to find honest and valuable connections, relationships, a wider family. Allowing myself to like myself, and to understand my flaws, has also given me space to think about what is important. As a result, I’ve solidified a lot of thoughts and feelings about life, about how I want to live, and who I want to be. I’ve learned that I value character – in myself, in my husband, my friends and family – over almost anything else. Success, focus, drive, are all nice, but if they come without character, then I don’t really admire the outcomes. Honesty that educates, or is kind, is so much better than honesty that serves no purpose. Humour is fine, but if it isn’t kind, or thoughtful, or enlightening, then it isn’t very funny. Beliefs are important, but if they come without understanding that others might believe differently, then they are shallow and self-serving. Caring out of duty or blood relationships is good – it is caring, after all - but caring out of compassion for another human says something about our true character, and delivers so much more. One-way relationships are ultimately selfish, and unrewarding, whereas equal, shared relationships – whether as life partners or simply next-door neighbours – are true connections. And it is in making these connections – in a way that honours who I am, and what I have both lost and found on this journey – that we find support, and love, and how we cement our place in and of the world. There is much more I could say about my philosophy of life, but I think this blog, perhaps more than anything in my life, speaks the truth of who I am. This year, it will be 15 years since I learned I’d never have children. A lot has changed since then. My 25 Gifts of Infertility posts* talk about how I’ve changed, and what I value. I’m proud of that. Finally, I think that, whilst I might have figured some of this out by my 50s anyway, my childlessness was a catalyst to thinking more deeply, as I tried to figure out how I felt about my life post-infertility, and how I was going to live the rest of my life, figuring out who I am, and what I value in my life. And that has been the most wonderful gift of all. * This is the final in this series. Well, unless another Gift of Infertility sneaks up on me!